Shut up/ Kiss me/ Hold me tight. 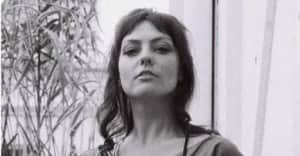 Angel Olsen is gearing up to release her new album My Woman on Friday, September 2. Last night she performed her song "Shut Up Kiss Me" on the Late Show with Stephen Colbert. Check out her performance above. Olsen worked with producer Justin Raisen (Charli XCX, Sky Ferreira) on the poppier, synth-based half of the album with the latter half of the album similar to her older material. Revisit "Intern" here.